Misty Rowan speaks faster than most humans I know, and is one of two poets I know whose main reason for writing is to educate on social issues. I liked her style immediately, because it was not like anyone’s I knew, and it had an unrestrained ferocity that a lot of Minnesotan poets lacked. As I’ve gotten to know Misty better, I’ve found that she is also ferociously kind. I enjoy the piece she’s done for Ring Ring Poetry because it is yet another part of her, a little softer, more sentimental. And because this is my neighborhood, too. 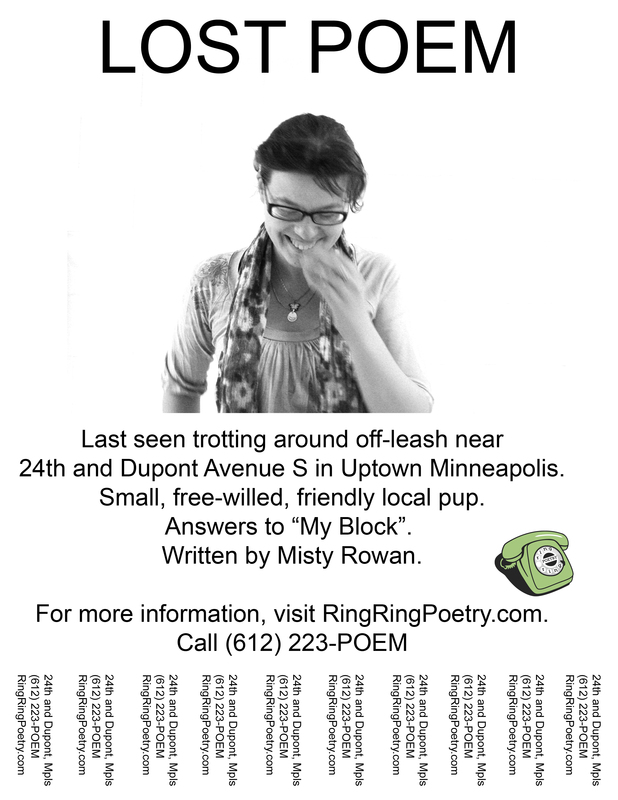 Call 612 223-POEM, and check out Misty’s post about her experience with this project.